Burell Built Exteriors | How does roof insulation work? To keep your home warm in the winter, your roof should be insulated. Because heat rises, it will head up to your roof, rather than keeping the home warm below. As much as a quarter of all heat in a home will be lost if your roof and attic aren’t insulated properly. While most people think of roof insulation for heat and keeping their homes warm, it also helps keep homes cool in warm weather. In the summers, it will help keep your home cool by blocking outside heat. Insulation also helps keep your heating and cooling systems working more efficiently and effectively. This will lower your energy costs during the hottest and coldest times of the year. Additionally, insulation will reduce noise and add value to your home. Generally, there are two kinds of insulation, fiberglass and foam insulation. Fiberglass insulation is the least expensive and usually easiest to install. It comes in batts or is rolled. It has to be fitted in tightly to reduce air flow. Insulation is assigned an R-value which is measures the ability to resist heat flow. Foam comes in two styles, either spray foam or rigid foam. Spray foam is usually used in the space between attic rafters, while rigid foam, which comes in sheets or panels, can be installed between rafters or beneath them. Both types of foam generally have high R-values. While any type of insulation will work for roofs, some prefer foam because it usually manages air flow better and the R-values are higher. Fiberglass insulation can sometimes get compressed, causing its R-value to decrease. If fiberglass isn’t fitted in properly it can leave gaps for airflow. 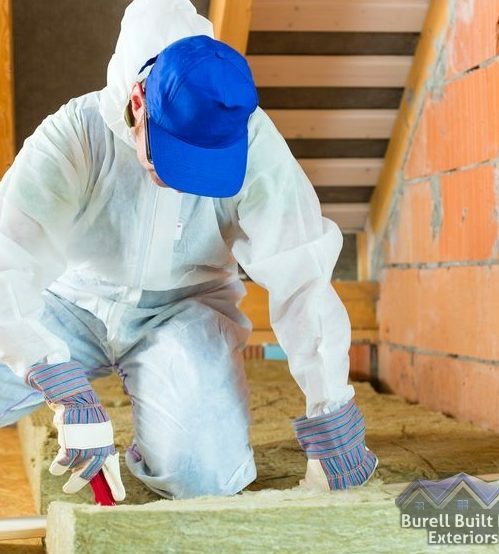 As your roof insulation service, Burell Built Exteriors, LLC in , TN, we usually recommend blown fiberglass over cellulose because it is fire resistant, durable and has very minimal settling. If you’re interested in learning more about our insulation services call (865) 385-6926. Even temperatures throughout the house: If your home has rooms colder than others, you’re insulation is poorly installed or you need more of it. Lower energy bills: When you have enough insulation, it helps your heating and air systems run more efficiently. Consistent temperatures in walls, floors and ceilings: Really cold walls, floors or ceilings indicate poor insulation. Insulation should help keep temperatures consistent. Lack of drafts: Insulation should seal up gaps that let cold air into the house. Prevention of leaks: Adequate insulation keeps moisture at bay. Can I insulate my attic roof? 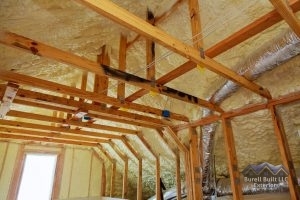 Anybody can insulate an attic roof as a DIY project. You will have to determine how much insulation you will need and whether you will want to use fiberglass or foam insulation. Fiberglass usually the least expensive for DIY projects. You will also have to make sure your roof is properly ventilated. Roof insulation and ventilation have to work together to maintain airflow and keep moisture out of the attic. Moisture build up can cause leaks and mold and mildew to grow. To properly ventilate an attic when it’s insulated, you will need to install rafter vents. They are placed under the roof sheathing between rafters. Make sure you clear obstructions to other vents as well. In a finished attic, you may not be able to get to all openings like the ceiling without removing drywall or other finishing material. Do roofers do insulation? 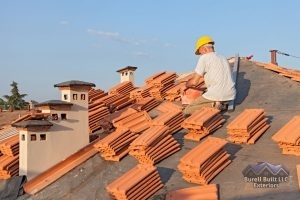 If you aren’t up to a DIY project, you may want to hire roofers to do it for you. Our team of roofers is available for all your roofing needs. Since heating and air systems are affected by insulation service, you might want to have professionals take a look at your heating and air systems to make sure they are working properly. Our locations in Alabama have great service for heating repair in AL. Some roofing systems like cathedral roofs have little or no attic space. Roof insulation with no attic is still possible with these types of roofs. Rigid foam insulation usually serves well in these cases. Our roofing professionals can answer questions about your insulation needs. Give them a call at (865) 385-6926. New insulation can be placed over old insulation. 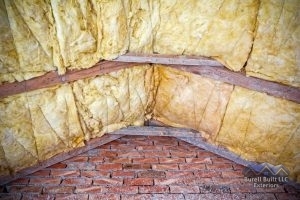 But avoid placing new insulation over the old if the old insulation is wet. If the old insulation is wet it’s possible mold and mildew could form. If you plan to install insulation in your home, you may want to check into our roof insulation contracting services in , TN and surrounding areas. To learn more about our services give us a call at (865) 385-6926. We are ready to help you. Posted in Uncategorized on March 13, 2019 at 4:55 pm by Burell Built Exteriors. Light Colored Metal Roofing Can Help Your Energy Efficiency. Trying to be energy efficient can seem exhausting. You can unplug appliances, turn off lights, and close your shutters, but what does that really do for you long term? If you really want to be more energy efficient, there are changes that can be made to your home. Changes like, getting a new roof or putting solar panels on your home. These are sustainable ways that don’t require you to think about anything other than the lower energy bill you will be getting in the mail once a month. Making sure that you know the different energy efficient appliances to give yourself an energy efficiency home crash course is the best way to figure out what will work for you and your budget. Energy efficiency is generally defined as the way in which one would lower their energy usage and find out what works best in their home to help conserve energy. Many people do this for environmental reasons, but the biggest reason of all is to save money. The terms energy efficiency vs energy conservation are always used interchangeably, but they do mean slightly different things. To conserve energy means that you are trying to keep it saved and managed. To be energy efficient is to still use energy but use it in the most useful and effective way possible. Both are doing the same things and are trying to save you money. There are a few different ways to be energy efficient during the winter. One of the best ways is to get roof insulation put in. This will help keep the heat inside of your home and not let the outside cold affect the temperature inside of the house. If you have a gas furnace, turn it off or only use it when it is fully necessary. Gas is great, but if you are trying to save money flip it off. If you have the option of a wood burning fireplace, that can be a great option to utilize. Make sure that you are opening your curtains and letting the light into your house on those cold days. Keeping the shutters closed will actually keep your home cooler. The less gas or electricity that is used, the better, so be conscious of your choices throughout the day. There are so many reasons why energy efficiency is important and should be to you as well. It will save you a lot of money in the long run to make sure that you are being careful about how much energy you are using. It will also increase your overall comfort because you will remain at a constant temperature in your home. Things like wall insulation is something that will help tremendously with that. The biggest reason that energy efficiency is important is because it will save you money on your energy bill every single month. What are the benefits of energy efficiency? The biggest benefit that you will actually see for yourself will be that your energy bill will be lower than it is currently. When you start to take out the things in your life that will take energy out of your home, you will see a difference in the way the air is and present a cleaner more non toxic home. You will also be reducing greenhouse gases and helping the Earth become a cleaner and better place. How can we improve energy efficiency? We can start improving energy efficiency in many different ways. Talking to a contractor about putting on a special roof or even solar panels is a great way to help keep the sun’s harmful uv rays off of your home and turn it into energy that can be used. There are big and small things that we can do to help get the most out of the energy that we are using and it is important to look for different ways that we can keep our bills lower and also do better for the environment. There are so many different ways that you can save energy around your home. Nothing is too big or too small, you just need to start somewhere so that you are able to save money wherever you can. At Burell Built Exteriors, LLC, we can help you save money on your roofing system and make it energy efficient if that is your goal. Call us at (865) 385-6926 and we can go over everything together and see what would work best for you. Our professionals have been doing this for a long time and will be able to see what you want and then come up with a quote so that we can get started. Making your home more energy efficient is something that you will never regret doing. Posted in Uncategorized on January 9, 2019 at 10:18 pm by Burell Built Exteriors. If you are thinking about re-roofing your home, knowing everything you can before you make this big investment is crucial. The average cost of a new roof is anywhere from $10,000 to upwards of $30,000 depending on the quality of materials used. Choosing a reputable roofing company, knowing your budget and style goals, and what type of damages you need to avoid with your new roof that caused your old roof to fail are important to note when deciding to get roof installation services. Since leaks are the most common damage to occur to a roof, getting durable roofing materials with waterproof and seamless flashing or decking is beneficial. Burell Built Exteriors, LLC provides roof installation in , TN. Call us at (865) 385-6926 if you are needing roofing systems in Chattanooga and Knoxville replaced or repaired. A roof replacement involves more than just installing a brand new roof. Many damages occur too early from improper and rushed installation methods that skip over critical but often forget about aspects of your roof. These include the areas that are barely considered when thinking of a roofing system: the gutters, chimney, flashing, soffit and fascia. In order to ensure you have a well-built roofing system that will last, these five points need to be considered when getting roof replacement services. Install flashing around your eaves: The best deterrent of water damage is having accurate flashing! Flashing is like a sealant for your roof that covers any gaps where water can seep through. Placing the flashing around your eaves, chimney, and other hard-to-reach areas that your roofing membrane misses prevents rainwater, ice dams, and animals from being able to enter through small cracks in your roof. Get good roof ventilation: Having properly installed and maintained soffit, fascia, and attic ventilation is key to helping your roof last longer. Hot air rises and gets trapped in your roof’s membrane decking, causing it to warp and fail. You’ll notice that your house is not being evenly cooled, or cooled at all when your roof is not getting good ventilation, causing your energy bills to skyrocket as your HVAC system has to work twice as hard to regulate temperatures. Install a chimney cap that is airtight: While having hot air escape is good in the warmer seasons, you want good insulation for those colder days. Hot air also escapes through your fireplace and chimney when the chimney cap is completely airtight. Installing metal flashing around its base will do the trick in properly ventilating and insulating air. Get energy efficient shingles: When installing roof shingles, choose shingles that are lighter in color and more lightweight. Choosing slightly more expensive shingles like architectural or 3 tab over asphalt shingles. Since asphalt shingles are made of darker color materials like felt and tar, they absorb sunlight, which heats up your roof and causes your home to feel hotter, raising not only the temperature, but your energy bills as well. Install low maintenance gutters: Paying more upfront for higher quality gutters are worth it as it prevents you from having to constantly clean out debris and leaves. Gutter guards are also designed like a filter to prevent clogs and overflow, which significantly lessens water damage to your roof. Low maintenance gutter systems like gutter guards work so well, they are even mandated in some storm prone states. How much will it cost? Are there any deposits required, and if so, how much? Will you pay and obtain the necessary permits? What is the warranty on your services? Do you recycle the old roof and do you clean up when you are done? There are many styles of roofing materials you can choose from when deciding to get roof installation in , TN from Burell Built Exteriors, LLC when you call us at (865) 385-6926. What roof material is best? Metal and tile roofing are the best options for longevity, but they are also on the pricier side. All types of residential roof materials provide some form of energy efficiency, but for optimum reflectivity, metal is the premier choice. Shingle and cedar shake shingle roofs are best for a textured and classic appearance. If you are willing to pay more upfront for a roof that will last a century, slate and tile resist just about everything imaginable for the ultimate in durability. The only downside is that they are extremely heavy, and some homes cannot support the weight. Getting a roof inspection can determine if your foundation can handle the pressure and weight. What Roof Material Is Best? For Shingle Roof Installation, Give Us A Call Today! Residential Metal Roofing: Popular metal materials for residential roofs include standing seam, aluminum, steel, copper, metal shingles, and stone coated steel. Not only is metal roofing extremely long lasting and durable, but it is also classified as a green roofing system. What is green roof installation, you ask? A green roofing system is just any environmentally friendly roofing system that does not add any harmful chemicals into the air, is recyclable, and uses natural energy as fuel. Metal is recyclable and highly reflective, making it one of the best roofing choices for significant energy and money savings. The cost for a metal roof can be anywhere from $13,000 to $21,000. 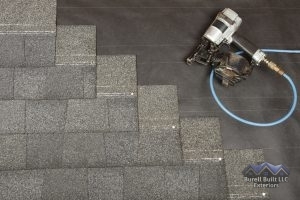 Shingle Roofing: The cheapest of all roofing systems, shingles are also known to be the most finicky, high maintenance, and unstable of the options. Asphalt shingles only last 20 years, which makes their installation prices very low, around $2,000 to $6,000. Higher end shingles like architectural can cost up to $12,000 but last 30 years. Wood shake shingles cost the most, from anywhere to $16,000 to $27,000, but they boost curb appeal and property value exponentially. Posted in Uncategorized on November 7, 2018 at 9:55 pm by Burell Built Exteriors. Why is Roof Insulation so Important? With winter around the corner, it is important to make sure you are prepared for the holidays by performing necessary tasks such as heater maintenance and roof insulation in Knoxville, TN. Including staying warm, properly insulated and heated homes provide a number of benefits that make them so sorely needed.The main point of roofing insulation is energy efficiency. The insulation that gets stuffed in your attic and between your roof decking helps enclose the empty air. Since hot air always travels to cooler areas, insulation stops this by preventing the hot air from rising and making your home blisteringly hot and ruining your roof. When temperatures are freezing, the hot air is then circulated back into the home thanks to the insulation. If you are needing roofing insulation or repair in the Chattanooga , TN area, call the roofers at Burell Built Exteriors, LLC at (865) 385-6926 today. Insulation helps keep all rooms an even temperature. Without it, you will find that some rooms are room temperature and others are freezing or sweltering because the air is not being ventilated effectively. Hot air produces greenhouse gas emissions, and even more is produced when it seeps through roofs covered in chemical coatings. Roofing insulation helps reduce this. Save up to 40% on your energy bills as your HVAC units don’t have to work as hard to regulate the air quality and try to evenly cool the entire home. Roofing insulation also helps with mold and moisture reduction as it absorbs it instead of letting the water seep through the roof and creating leaks. Posted in Uncategorized on September 26, 2018 at 6:44 pm by Burell Built Exteriors. Throughout the year, you spend hundreds on energy costs. But your home can be more energy efficient with minimal work. In fact, changing only a few things around your home can save you up to 20 percent on your energy bills. Whether you want lower bills or you’re looking for more environmentally friendly energy use, these quick, affordable tips can help you save on energy in your home. 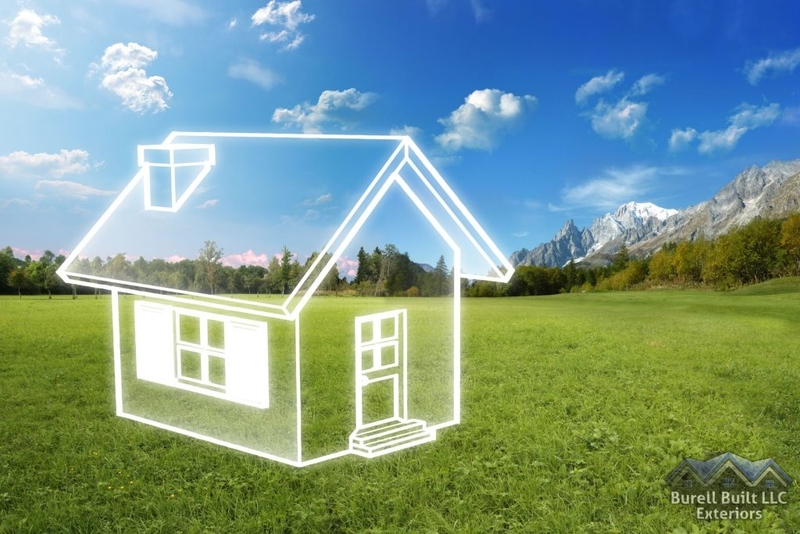 By Making Just a Few Changes, YOur Home Can Drastically Improve Its Energy Efficiency. How Can I Save on Energy Costs in My Home? High energy costs within your home are usually due to drafts and poor insulation and seals. This can be easily solved by running weather stripping around window and door openings. Your roof, HVAC system, and plumbing can also drain energy from your home. Roofing Maintenance and Material Selection: Regular roof maintenance can help minimize damages that cause room for air leaks. These inspections can also identify damaged material that should be replaced in order to create the proper protection for your home. Replacing standard shingles with a more energy efficient material such as Atlas and Petersen metal roofing provides unbeatable UV protection for any rooftop. This material is durable, UV resistant, and low maintenance. Appliance Maintenance: Ensuring your water heater and plumbing appliances are effectively working can save run-time which minimizes energy use. Thee systems can quickly drain energy by continuously running or running too frequently. Proper maintenance and care of your plumbing pumps and other appliances can help minimize the energy your home uses. HVAC Control & Window Care: Heating and AC systems are considered one of the top ways a home can potentially lose energy. When these systems come on too often, they quickly use energy, driving up your home’s bills. Ensuring your windows and doors are properly sealed and in good order can help keep conditioned air inside your home, relieving your HVAC unit’s workload and allowing you to save on energy costs. Proper HVAC maintenance is also crucial for a properly working system. No matter where you live and what type of energy your home uses, there are multiple ways to minimize the cost. For more ideas on how to save on energy, or to begin your energy saving roof project, call the Burell Built Exteriors, LLC experts at (865) 385-6926. Posted in Uncategorized on August 24, 2018 at 8:51 pm by Burell Built Exteriors. Duro-Last PVC Roofing is Available in Both Material Rolls and Prefabricated Units. There are single ply membranes on the market with the outstanding protective capabilities and impressive warranty like Duro-Last! In general, PVC offers fantastic protection for a very modest price, with features like enhanced light reflection and weather resistance. Duro-Last takes it a step further however, providing smart business owners with a single ply system meant to last over 30 years! That’s uncommonly high for the single ply roofing market, but perhaps not surprising for one of “the world’s largest manufacturer of custom-fabricated, thermoplastic single-ply roofing systems“. TPO roofing has a large following, namely because of its flexibility, capable protection, and energy efficiency. With Duro-Last, many of these abilities are magnified on an even greater scale. Some of this comes from the fact that this top roofing company is able to manufacture custom prefabrication reduces the number of seams by up to 85%. Fewer seams allows for a faster installation process and reduces the potential for leaks as well. This means this PVC roofing also comes lower labor costs over time. You can find detailed specifications information on the Duro-Last website. Few single ply roofing systems can compete with this PVC membrane’s incredible warranties. Duro-Last offers a 15 year warranty (with consequential damages included), but the company also provides 25 and 30 year option warranties. That’s three decades of warrantied protection! These warranties are only available for new construction and “tear-off projects with approved roof decks.” Installation methods include mechanical locking, induction welding, and adhering. All you need to be approved for the warranty is a qualifying roofing contractor, such as Burell Built Exteriors, LLC, to provide the installation. As part of the warranty, a Duro-Last Quality Assurance Technical Representative will examine the commercial system to ensure proper installation. There are numerous types of single ply membrane roofing products available on the commercial market today. Few of them can compare with Duro-Last’s PVC membrane. It offers incredible energy-efficiency (qualifying for LEED credit) and highly capable tear resistance. If your business is interested in learning more about this fantastic roofing product, feel free to speak with a member of our experienced roofing team at Burell Built Exteriors, LLC. Give us a call at (865) 385-6926! Posted in Uncategorized on July 23, 2018 at 8:32 pm by Burell Built Exteriors. Is It Time For New Insulation? Insulation Plays a Vital Role in Home Comfort and Roof Defense. A key part of any home, many people do not think about their roof and attic insulation after it has initially been installed. However, these parts of your home play a critical role in keeping your home safe from damage and comfort issues. Over time, it may break down and become worn, leading to failure and other problems for your home. Keeping this system at its best can prevent damage to your property. Not sure if you need insulation replacement? Keep an eye out for the following signs. High Energy Bills – Your insulation helps your home control how it maintains your home comfort. If your insulation has worn, it can allow external heat or cold to seep into the home and make your heater or air conditioner work harder, raising energy consumption. A Consistent Draft – Poorly installed or broken down insulation allows the outdoor temperature to invade your home, preventing your property from being comfortable. If your home is chilly even when your windows and doors are close, you may need replacement. Roof Leak Occurs – While your insulation can prevent water from damaging your home structure, it can also be damaged by water. The moisture retained can allow mold, mildew, and algae to grow, harming your home and possible affecting your health. Critters In The Attic – Have you seen bugs or pests in your home’s attic? These creatures may tear apart your insulation to not only enter your home, but use it as a nesting material. Replacement can refortify your roof and restore protection. Have you noticed these signs in your home? When it is time for roof insulation replacement for your home in , TN, Burell Built Exteriors, LLC is proud to provide you with quality service for your needs. Call us today at (865) 385-6926 to speak with our expert roofers about your needs. Posted in Uncategorized on June 19, 2018 at 3:18 pm by Burell Built Exteriors. Damaged and Displaced Shingles Can Serve as a Ready Signal for Replacement. Like all roofing materials, asphalt shingles will eventually reach the end of their usefulness. When this happens, you will find yourself in need of a new shingle roof. Asphalt shingles typically last for around 20 years if they have received the benefit of regular maintenance. If you think the day has arrived to replace your old roof, pay attention for the following signs. Shingles that have become excessively damaged can signal the need for an altogether new roof. Curled, missing, or cracked shingles have all undergone various forms of damage. If curled, your shingles have likely begun to lose their protective roofing granules, and are dried out from exposure to the sun. Shingles in this condition cannot protect your roof from leaks, and have become essentially worthless. Shingles that are missing or cracked have likely undergone storm damage. While some instances of storm damage can benefit from repair, extensive damage requires replacement. Missing shingles likely were displaced by the wind. Cracked shingles became as such thanks to hail or debris impacts. Faulty or incorrectly installed shingles become more susceptible to these types of damages, and also need replacement. Even in the absence of the damages described above, a roof could still need replacement. If you know that your roof has surpassed 15 or 20 years of age, you need to schedule an inspection and consider replacement. Old age can lead to a host of issues with roofing, including granule loss. As shingles age, they begin to lose their roofing granules. These will collect inside your gutters, and serve to signal that your roof needs replacement. Granules protect shingles from impacts and the sun, and only disperse when a roof has reached an extended age, or if the roofing itself has inherent flaws. If you find yourself in need of a new shingle roof in , TN, call Burell Built Exteriors, LLC at (865) 385-6926. We’re your local experts for roofing, and perform exceptional work when our clients need. Posted in Uncategorized on May 15, 2018 at 4:35 pm by Burell Built Exteriors. 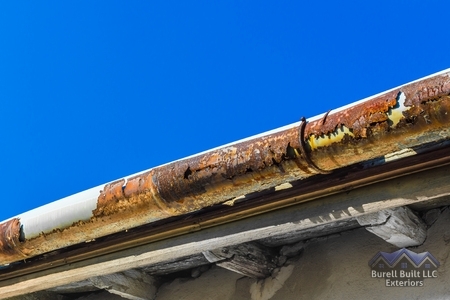 Cleaning Out Your Gutters Prevents Corrosion on Your Roof. Are you curious how to get the most out of your metal roof? Steel, aluminum, copper, and other metals are renowned for their ability to endure intense weather and corrosion. One of the best parts about metal roofs is that they seldom require extensive repairs. As a matter of fact you can do much of the maintenance yourself. Use these three steps as a guide when maintaining a metal roof. Step 1: Take a Walk. Relax, you won’t have to go far. With a pair of binoculars, walk around the edge of your house and inspect your roof. You’ll be looking for debris (such as branches or twigs), smudges, metal chips in the paint coating, and any loose screws. Once you’re finished with your inspection, grab a trash bag, a ladder, and a sponge. Debris can accelerate natural corrosion on your roof’s paint. 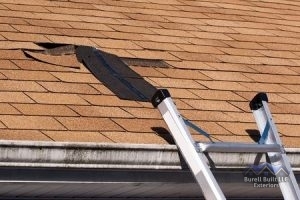 When cleaning out the debris, be sure to also empty your gutters as well. If you find any metal chips stuck in your roof’s coating, carefully remove them if you can. Once you’ve cleaned off the debris, you’ll be able to safely manage any additional touch ups your roof needs. For any smudges you find, you can apply Formula 409 (or any comparable solution) and wipe them off with a gentle sponge. If you spotted any metal chips or scratches earlier, make sure to do touch ups with a paint brush, instead of a sprayer. Your manufacturer can help you find the paint that’s right for your particular metal. That’s it; you’re done! Maintaining a metal roof doesn’t have to be hard. With just two simple DIY inspections every year, you can ensure that your roof reaches its maximum lifetime potential. For more information about metal roofs, give us a call at(865) 385-6926. Posted in Uncategorized on April 12, 2018 at 5:10 pm by Burell Built Exteriors. Find Out When You Need Gutter Replacement Service. The gutters on our roofing systems are important to the health of our roofs. They ensure that rainwater is moved from the roof and onto your lawn so that the roof is flooded. However, there are times when a gutter replacement will become necessary. This can be needed for many reasons, which we have outlined in the following section. Damages to your gutters can vary from cracks to complete rusting. When your gutters are damaged, they can lead to other problems down the road. When gutters aren’t cleaned, the leaves and other debris can cause the water in the gutters to overflow. Water flooding onto your lawn can get onto your foundation, which can cause cracks. Another reason for a gutter replacement is when overflowing gutters flood your lawn. A flooded lawn due to gutter malfunctioning can really wreak havoc on your lawn. Sagging gutters can be due to too much water, leaves, and debris that have not been cleaned out. Too much weight in the gutters can cause them to sag. Gutters that are pulling away from the roof need to be replaced. There could be other underlying problems that are causing them to pull away that will also need to be addressed. If you see nails or even screws on the ground right underneath your gutters, they are loosening from the gutters. If this is a continual problem, you will need to replace your gutters. If you think you need gutter replacement service, call the roofers at Burell Built Exteriors, LLC at (865) 385-6926 for residential roofing in Knoxville, TN, and Chattanooga, TN. Posted in Uncategorized on March 12, 2018 at 4:47 pm by Burell Built Exteriors.